For my soul, it longeth, yea fainteth for the courts of the Lord. Our Memorial Garden was dedicated on September 23, 2001, and is a place of peace and repose for the ashes of those inurned within its wall. The wall contains secure niches for cremated remains. Paved paths and benches offer opportunity for private meditation. 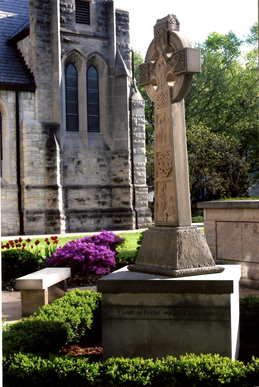 A traditional Celtic cross, donated by Mary Alice Davis in memory of her husband, depicts the post resurrection appearances of Christ when he appeared in the garden. The Garden is available for the inurnment of cremains; first, to members of Westminster, and their immediate families; and second, to friends of the church, upon approval of the Session. Persons desiring to reserve space in the garden are invited to read the policies by clicking here and to complete one application form for each individual by ﻿﻿clicking here﻿﻿. Westminster’s Memorial Garden added a south wall in May, 2018. It is parallel to Edwards Street and perpendicular to the east wall providing an additional 180 niches for members and friends of our faith community. Evans-Mason was retained to do the work. We are grateful to Architect Dave Leonatti who gifted his design of the wall. On Sunday, May 27, Chris Elzea presented a Ministry Moment on behalf of the Memorial Garden Committee: Bill Donels; Chair, Chris Elzea, Richard Herndon, Dr. Glen Pittman, Dr. Andrew Sherrick and Lionel Stirrett. Memorial Garden brochures will also be included in the bulletin insert. The east wall has several single niches left. The cost of an individual inurnment in the east wall is $750 for a member or their immediate family and $1,500 for friends of Westminster. The cost of an individual inurnment in the new wall is $1000 for a member or their immediate family and $2,000 for friends of Westminster. Persons desiring to reserve space may complete an application form located in the West Narthex. In 2016, the Memorial Garden Committee added this webpage to the Westminster Presbyterian Church website with pertinent information about those inurned in the garden. Those currently inurned in the Memorial Garden are listed below. Historic and pertinent information can be found by clicking on each name. This preserves our loved ones’ memories for generations to come and provides a resource for genealogy. Fixmer III, John "Jack" P.